Adarsh is a 7 year old boy. Adarsh is one of 4 children. His father earns very little as a farmer. Their farm land is low lying and gets flooded easily during heavy rain which ruins the crops that they rely on for food and a meagre income. 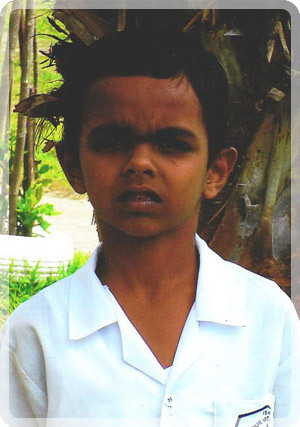 Adarsh enjoys attending school and his favourite school subject is English. When he is not at school he loves to play soccer. Adarsh travels to school each day on foot. Adarsh is hard working at school. If he gets assistance he can progress to a higher level of education. Adarsh now receives the education every child deserves.